You hear of pregnancy cravings, but is a postpartum craving a legitimate thing? Because if so, I've had one for brownies ever since the twins were born. A month ago (sidenote - they are already a month old??). Understandably, my baking time is limited, so I just recently got around to fulfilling my craving. And I have three words for you: worth the wait. These brownies are pretty famous. Oprah has included them in her list of "Favorite Things." America's Test Kitchen declared them to be the best brownies ever. As did the Today show. Dozens of bloggers have agreed. This is the ultimate brownie. Here's what makes these brownies stand out (in my humble opinion): Five eggs. Five. 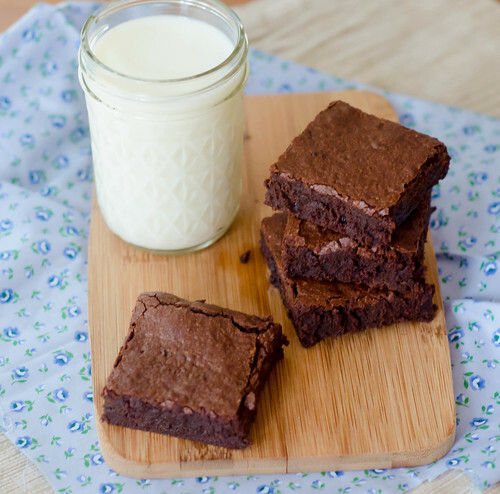 This helps give them that chewy, fudgy perfection that I love so much in a brownie. Eleven ounces of dark chocolate - making them intensely chocolately. Espresso powder - brings out the chocolate flavor. Dark cocoa powder - again, more chocolate. And ever so slightly underbaking them - by just a minute or two. This helps them retain that wonderful chewiness. Otherwise, you're getting into dry, cakey territory. And nobody wants that. ... and just as a PSA, these brownies make an excellent snack at 3am if you should happen to be awake and hungry.... not that I'm speaking from experience or anything. Preheat the oven to 350 degrees and butter the sides of a 9x13 inch baking dish (the empty butter wrappers work really well for this). Combine the chopped chocolate, butter, and instant coffee in a large microwave-safe bowl. Microwave the ingredients at 20-30 second intervals, stirring well after each time. When the chocolate is melted, whisk in the granulated and brown sugars. The mixture should be room temperature. Add 3 eggs to the chocolate mixture and whisk until combined. Add the remaining 2 eggs and the vanilla, and whisk until just incorporated. Sprinkle the flour mixture over the chocolate and use a spatula to fold it into the chocolate mixture, stopping when just a little flour is still visible. Pour the batter into the prepared pan and smooth the top. Bake for 25-30 minutes, rotating the pan halfway through baking time. When a toothpick inserted in the center comes out with a few crumbs sticking to it, remove the brownies from the oven. I started checking them around 23 minutes, and took them out around 26 I think (my oven tends to cook things a little faster). Cool completely, then cut into squares. I definitely got post-partum cravings. I attributed it to nursing. Yes, I definitely had post-partum cravings. Sadly, mine was for Oreo's and not these fantastic looking brownies. These brownies look divine!! And for the record, my post partum cravings included sparkling grape juice. I wanted to chug it. um, you have twins and two OTHER young kids...I'm pretty sure any craving you have is totally warranted and legit! I've made the sweet and salty brownies from baked but never the originals (amazing)...think it's time I get on the bandwagon! Ali, YES! I made those last year and they are amazing! 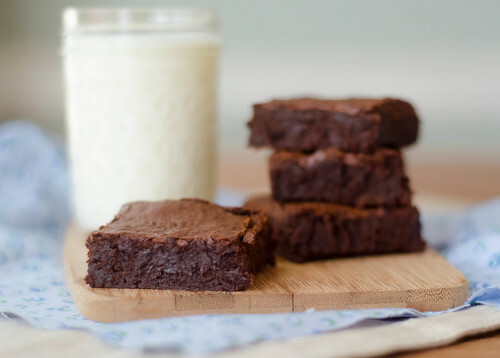 Side note: these brownies are AMAZING straight from the freezer. Yum. I want these now after reading your description and seeing the picture. What a fabulous recipe! so gorgeous! I just made these today and, oh my they were delicious! p.s. congratulations on your new babies. I love this write up, Josie. So cute!